This is no more a secret that iOS 7 Jailbreak is out for public jailbreak. The team behind iOS 7 Jailbreak exploit, evad3rs, has released the iOS 7 jailbreak tool in public this morning. 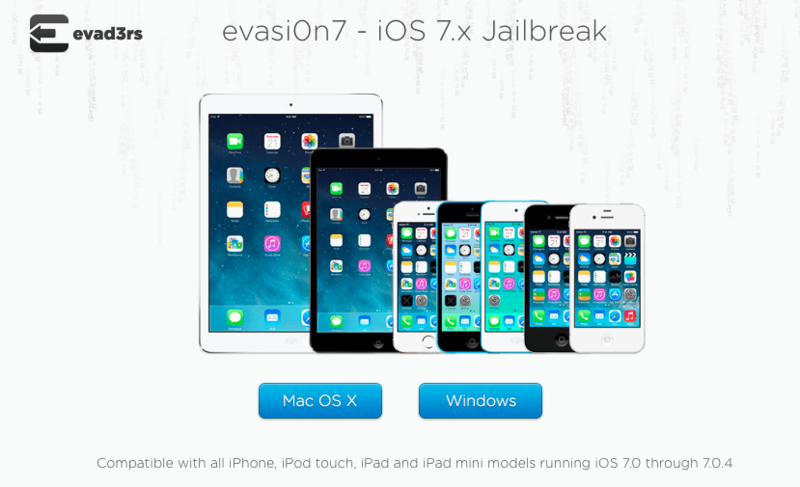 The new jailbreak tool is called “evasi0n7”, and it runs on both Windows and Mac OS X machines to deliver iOS 7 Jailbreak on all iPhone, iPad, iPod touch, and iPad mini devices. As you can see here, we have already covered a very tense detail on iOS 7 Jailbreak release, and as well as covered the how to guides on how to perform iOS 7 jailbreak on your device. However, after publishing the tutorials, we started receiving numerous comments and emails from our readers that they are experiencing wide-range of issues with Evasi0n7 tool. We have also checked out the social networks to see the storm, and guess what? A large number of iOS 7.0.x running users are facing issues with iOS 7 Jailbreak evasi0n7 tool on both Windows and Mac OS X. Once you start jailbreak iOS 7 tool, it will start jailbreaking your iOS device. However, if it get stuck on any point or you feel that it is now wasting your time and energy, then don’t hesitate to close the application and hard-reboot your device with pressing and holding home + power button. If at any step the evasi0n7 jailbreak goes unsuccessful or you figured out an error with the tool. Just unplug your device, and if it still turns on properly than try again. Otherwise, restore your iPhone or iPad device with latest iOS 7.0.4 ipsw to run again the evasi0n7 tool. It is a known bug with evasi0n7 tool that it doesn’t work with any device that is recently updated with OTA update. So, it is always a good run to restore your device. With the imminent launch of an iOS 7 Jailbreak in public, things turn out slightly different for everyone including. We learned that hackers were working on the new version of Cydia, and after jailbreaking our device we learned there was no new design. But we noticed lot of heat on Twitter from all over the iOS jailbreaking community on the release, some appreciated, and some criticized evad3rs. The founder of Cydia is said to be was not in loop with Evad3rs, and the jailbreak comes out even before his wake up alarm. He was not told to get ready for the launch of latest Cydia, and MobileSubstrate version. He was not even provided with any beta testing code to make it work more smooth with his Cydia application. There is no secret, the iOS 7 Jailbreak goes public few hours ago, and every developer is not ready to launch updates for their tweaks and applications to work on iOS 7. There are only few applications, and tweaks that support the new iOS 7 core. We will update this post with more general questions, FAQ’s about the evasi0n7 jailbreak.